Watching the U.S. labor markets, I have long been impressed that initial jobless claims are one of the best real-time indicators of the health of the overall economy. And right now, they are white hot. When the economy is normal, there are 300k to 350k claims for unemployment insurance filed across the nation. When claims rise above 400k, it is a sure sign of recession. Often, it takes months or years into a recovery for claims to drop down below that red line again. However, it is rare for claims to drop below 300k. Very rare for that level to be sustained. 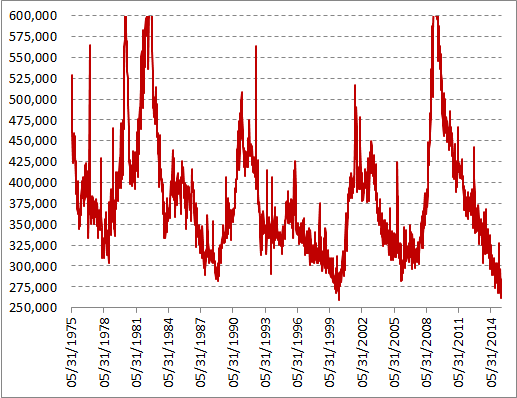 What’s really extraordinary is when jobless claims fall below 275. That’s where they have been for the past 14 weeks. The only other time claims went below that line was in the second quarter of 2000, right before the dot-com bubble burst. I have no idea if white-hot jobless claims trend is alarming, but I have every confidence that it means the labor market is strengthening faster than most realize. The wage inflation data may not show it yet, but I fully expect higher wages and labor force participation in the months ahead. UPDATE: I posted in a new version of the chart, saved on the WordPress site instead of just pasted in from excel. Hope you all can see it. 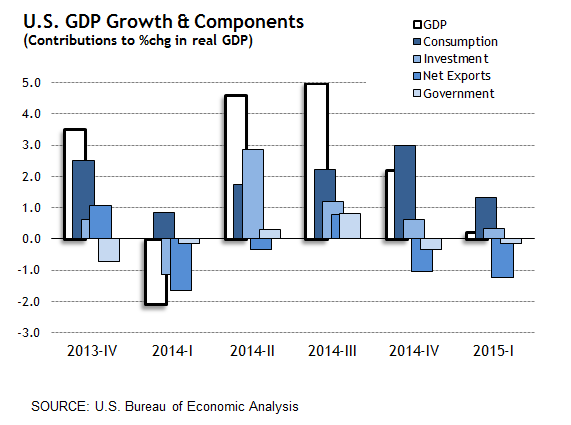 Contextualizing GDP growth in the U.S.
Today the Bureau of Labor Statistics published the first look at Q1 Gross Domestic Product and its components. The headline number was revealed to be a surprisingly low 0.2 percent. This is alarming, but not just because it defied the consensus prediction. Any single estimate, especially a preliminary one, is not in itself alarming. What’s alarming is the trend. We see weak Consumption growth, above all. The net exports number is negative, but that won’t last (more on that below) and besides it was negative last quarter, too. What surprises me is the disappearance of Investment. Realize that a year ago the economy wasn’t just stalling, it was contracting. Rather than get worked up about one quarter, let’s look at the whole recovery to date. In the next chart, consider how the current recovery’s average growth rate (and average component growth rates) compares to previous expansions. I calculated each of the expansions based on NBER business cycle dates, trough to peak. 1. The new normal (this expansion) does not look very healthy. Overall, the GDP growth rate is half of the rate in the 80s expansion. Even more interesting is what looks like a clear linear trend of slower overall GDP growth from 4.4 to 3.8 to 2.9 to the current 2.2. But why? Keep in mind that the lengths of the periods being averaged are not equal. The 80s expansion is the 3rd longest in US history at 108 months, while the 90s expansion is the 1st longest at 128 months. In contrast, the 2000s expansion is “merely” 81 months which, oddly, is also the length of the current expansion. 2. Net exports are a non-story. Currently, the impact of net exports is a mild reduction to topline GDP growth in recent years, maybe 0.1 percentage points, the same as every previous expansion. Moreover, you don’t find the gains of trade in these topline figures, rather they come from cost efficiency in intermediate goods. Regardless, people spinning blame for weak growth this quarter or this year on Greece or China are not checking their history. We’re lucky there IS a China (there essentially wasn’t one in the 1980s). Scapegoating foreigners is always lame, but especially here. 3. The components do not show weakness in Investment during our era.To be honest, I thought “I” would be revealed as weaker today relative to recoveries past. To the contrary, what’s most different in the expansion since 2009 is the weaker Consumption and Government. I wasn’t satisfied with the second chart because it doesn’t put each recovery in context of the depth of the recession the economy “bounces back” from. This is important because in 2009, the White House and CEA were claiming that the recovery was likely to be very strong because the recession had been very deep. Greg Mankiw posted an astute comment on his blog at the time which has been on my mind ever since: “The purpose of this picture is to show that deeper-than-average recessions are followed by faster-than-average recoveries. ” (read it here). Naturally, he was attacked by Paul Krugman for daring to question what was unquestionable: the certainty of a strong recovery (stronger still thanks to the Stimulus). It is striking that the debate raged for a year or two – there’s always tomorrow, right? — but nobody believes today what apparently everybody believed in 2009. This really begs the question, why is the economy NOT rebounding back to trend? My Hoover colleague, John “Grumpy” Cochrane, has some interesting things to say about unit roots and trends, but the bottom line is that the very idea of Potential GDP has become slightly metaphysical. I have mixed feelings about it. The ’01 recession is an odd duck — average GDP growth was bizarrely positive, albeit tiny. 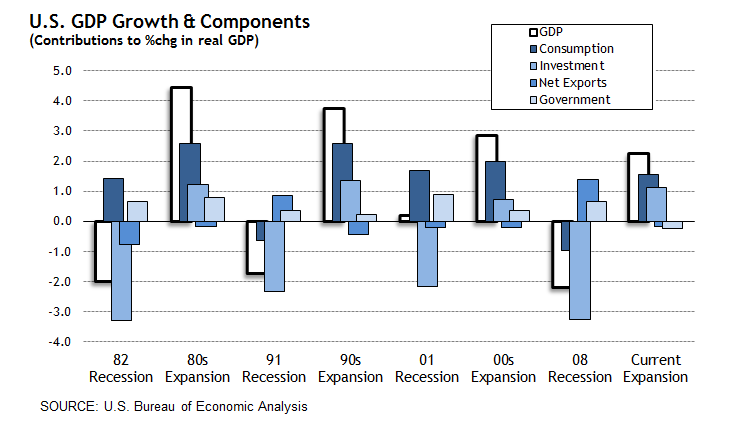 Consumption growth was not derailed at all. If you believe that boom is proportional to bust, then the mildness of the 00s expansion makes sense. But that means the current expansion does not. And the very sharp drop in Consumption in the 08 recession and current recovery signal that something permanent shifted negatively during the financial crisis. A final, vital piece of context is that all growth is good growth. What I mean is that our collective focus on “weak growth” is an oxymoron. Even the weakest growth means that the economy is richer than it was the quarter before. 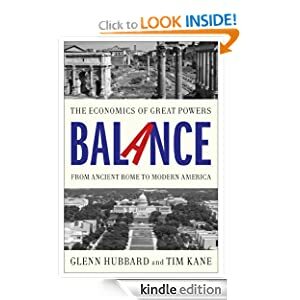 By comparing 2015 to 1985, the actual underlying economies are radically different in ways from the composition of the labor force to the nature of money itself. But still, I’m left with a sense that the engine of US growth — our institutions — have changed for the worse. That’s alarming. Today’s jobs report is a lot like the last one and the one before: mixed signals. The unemployment rate is unchanged at 5.5 percent. Payroll growth is positive but timid at 126,000 when economists had apparently expected twice that. Seven cents were added to the average hourly wage, which is faster than normal. And finally, worst of all, continuing the trend of the past 5 years, the labor force declined by nearly 100,000 people. Those are mixed signals, but it is exactly what I expected. The most alarming central fact of the economy’s new normal is that it is bleeding people. Here’s a quick and dirty facts from BLS data on the labor force participation rate overall (LFPR) and the rate for people between the ages of 25-54. This disproves the contention that the change is just about demographics. This is the new normal. So why is LFPR down three and a half percent? That’s the magic question. The Washington Post has a short article about gerrymandering with a deeply flawed graphic. By that, I mean the graphic implies that the most partisan district lines are the ideal. How crazy is that? One hand at the Post is writing (for decades) that partisanship has gotten out of control, but the other hand says that partisanship in extreme districts is the answer. This chart’s “1. Perfect representation” system is deeply flawed — it has 5 extreme incumbents who will never face a challenger. Not perfect at all. It looks a lot like the incumbency-protection gerrymander in California from 2002-2012. It is the kind of system the monopoly parties love, candidates hate, and where people are irrelevant. 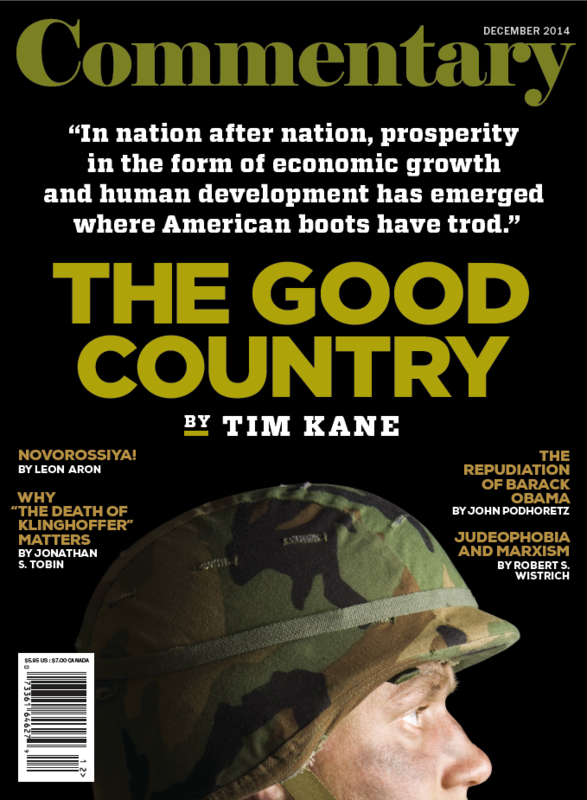 Commentary magazine featured my essay on its December cover, The Good Country, which reports some astounding empirical correlations between U.S. troop deployments with economic and social development indicators in countries around the world. This finding is difficult from some to accept, particularly those who believe that the United States is too militaristic and meddlesome in the affairs of other countries. I’d like to challenge my Libertarian friends to think more carefully about what “The Good Country” means — because the simple interpretation is misleading. In country after country, prosperity—in the form of economic growth and human development—has emerged where American boots have trod. … Indeed, from 1950 to 2010, more than 30 million U.S. troops were deployed around the world, the vast majority to allied countries, stationed in permanent bases, and cooperating in peace. They were building, not destroying. … [A]llied countries with a greater U.S. troop presence experienced better outcomes on measures of life expectancy and children’s mortality. This effect held even for countries growing at the same rate. Furthermore, it held during two distinct eras, pre- and post-1990. Life expectancy worldwide increased by 10 years between 1970 and the present. But it improved more quickly in countries that hosted American troops, and more slowly elsewhere. The worldwide mortality rate of children dropped from 132 to 55 per 1,000 live births during the same period, but again, the results were better among America’s allies. And finally, the third key point is that these alliance relationships worked because of demand for U.S. troops, not just the supply. It would be a mistake to read the evidence about the positive impact of troop deployments as a clarion call for, simply, more. … Let’s think about this from the economist’s perspective of supply and demand. A strategy of pushing troops to poor, unstable countries is not the way this policy works. The lesson in all of this for libertarians, even pacifist libertarians, is that America’s foreign policy should emphasize alliances more than monster-hunting. This is an essay — indeed a worldview — that libertarians should embrace and extend. I would like to think it would drive a wedge between pacifists (who surely support a policy of preventing war) and isolationists (who are willing to let war ravage the rest of world so long as it does not touch our shores). If you really think the presence of American forces throughout the Pacific from 1945-1990 did nothing to prevent a follow-up war between China, Korea, Japan, and the rest, I think you are beyond reason. Contrast that with the experience of Europeans post-WW1 and post-WW2. A pacifist recognizes the failure of the post-WW1 disengagement and embraces the continued presence of US forces in Europe after WW2, including former foes Italy and Germany as well wartime allies France and Britain. It worked: No WW3.